A little bit of Southern barbecue by way of Chicago at this downtown Brea eatery. 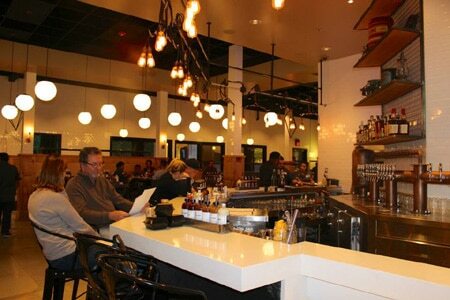 : There’s nothing pretentious about this downtown Brea offshoot of the popular Chicago-based barbecue joint. The bright interior, light-wood tables, and the hand-washing station conveniently tucked into the back corner of the eatery help set the stage for some downhome cookin’. Chef Cody Havener oversees executive chef Charlie McKenna’s brand of ’cue, which has an influence that is primarily drawn from the Carolinas. Starters such as the fried pickles and the airy pork rinds demonstrate these Southern ties, as does the flavorful crawfish Caesar salad. We recommend the Taste of LQ platter if you’re coming for the barbecue, since it gives you the chance to sample a trio of meats. But the other items are worth a look as well, most notably the smoked fried chicken and the creamy shrimp and grits. Each table is equipped with a half-dozen bottles of homemade sauces, so you can douse and experiment to your heart’s content. Desserts are highlighted by Southern treats: banana pudding and brioche bread pudding. There’s a long list of beers from which to choose, including craft selections from local breweries like neighboring TAPS Fish House & Brewery. On Sundays, hungry patrons can indulge in a brunch marked by mimosas, a buffet of smoked meats, and special made-to-order dishes like chicken and waffles.